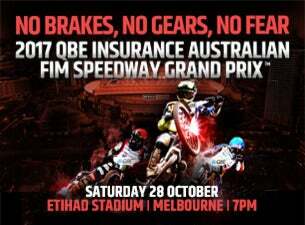 For the third consecutive year Etihad Stadium will host the QBE Insurance Australian FIM Speedway Grand Prix. The Australian GP again to be hosted on a purpose built track under Etihad Stadium’s retractable roof on Saturday, October 28, 2017 will be the last FIM Speedway Grand Prix of the year, with the World Champion crowned at the conclusion of the event. Three-time world champion and the sport’s most decorated Australian rider Jason Crump said Etihad Stadium’s continued commitment to the international GP was tremendous news for all associated with speedway both in Australia and overseas. “The first two SGPs at Etihad Stadium attracted in the range of 45,000 fans, and with recent outstanding performances by Australian riders on the international stage, plus confirmation of a third Melbourne event, it’s a tremendous shot in the arm for speedway,” Crump said. Chris Holder took the honours at the recent Australian GP and Jason Doyle was leading the 2016 world rankings but crashed out of world championship contention after suffering serious injuries at the Torun FIM Speedway Grand Prix of Poland just a few weeks before the Melbourne event. “Holder and Doyle are two of the world’s best riders and if they’re within striking distance of the world championship next season, speedway fans will converge on Melbourne in huge numbers similar to what we see across Europe and the UK,” Jason Crump said. Etihad Stadium CEO Michael Green said it was great news that Etihad Stadium would host the QBE Insurance Australian FIM Insurance Grand Prix for another year. “It’s further confirmation of our capacity to be a multi-purpose venue and host amazing and diverse events. The riders are courageous warriors and deliver one of the most spectacular events we have seen at Etihad Stadium,” he said. Victoria’s Minister for Sport John Eren said the Australian FIM Speedway GP takes a pride of place on the State’s world-class calendar of events. “We’re delighted to be welcoming back the event for a third straight year. It’s a stunning spectacle and a big boost to the economy. “The big motorsports events attract visitors from all over Australia and the world who want to see the best of the best in action. They keep our bars and restaurants full and provide jobs for Victorians,” the Minister said. Managing Director of BSI Speedway, the SGP’s rights holder, Torben Olsen, said it would be again fitting to crown the world champion in a country which was one of the pioneers of speedway. “The riders love coming to Melbourne and we believe the event will see even bigger numbers through the gates next year. Chris Holder’s success in Melbourne this year helped to produce an electric atmosphere and I believe we can achieve an even greater outcome in October next year,” Mr Olsen said.